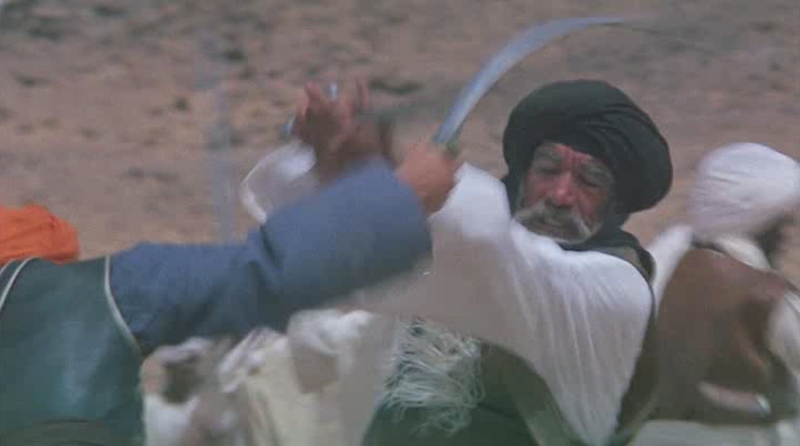 If this movie is to be believed, most of Mohammad’s enemies died because they used rubber swords. Strange combination of historical epic and religious propaganda. In a sense, the nearest comparison would be Ben-Hur; unfortunately, this is no Ben-Hur. It tells the story of Mohammad and the birth of Islam but it’s hamstrung by its adherence to Islamic beliefs regarding depictions of Mohammad. An opening card informs the audience: “The makers of this film honour the Islamic tradition which holds that the impersonation of the Prophet offends against the spirituality of his message. Therefore, the person of Mohammad will not be shown”. Consequently we get an epic biopic missing its protagonist, instead resorting to ridiculous workarounds such as showing his camel’s head (he’s supposedly just off-screen!) and shooting some sequences from his point of view (placing his staff in frame as though it’s a weapon in a first-person shooter game!). Other than that, the story is told in a fairly conservative, straightforward way, hammering home the view that Mohammad’s opponents were driven by greed and that his message was just totally awesome and should have been immediately taken up by everyone. There’s a lot of time spent on the efforts of the merchants and leaders of Mecca to suppress the growing movement, so much so that it’s almost two hours before we get a proper battle scene. When the battles start things do pick up a bit, but by then it’s a case of too little too late. There are some fair performances and it held my interest all the way through (that’s three hours! ); it just isn’t the kind of straight historical epic I wanted it to be. Perhaps part of the problem, and the source of the sense that it amounts to religious propaganda, is that (as explicitly stated in another opening card) its content was vetted by an Islamic university in Cairo and something called the “High Islamic Congress of the Shiat in Lebanon” (which, when googled, leads only to references to this film). This entry was posted in 1976, 5.5, Reviews and tagged Anthony Quinn, Ben-Hur, Biopic, Film, High Islamic Congress of the Shiat in Lebanon, Historical Epic, Irene Papas, Mohammad Messenger of God, Moustapha Akkad, Movie Reviews, Movies, Religious Film, The Message on June 3, 2014 by moviesandbacon. Because the film tells the story of the life of the Prophet Muhammad from the perspective of Muslims, it is “religious propaganda”? I suppose if the film was directed by someone who was critical of Islam and represented the Prophet Muhammad in a poor light, you’d be praising the film’s authenticity? Like most people with a negative opinion of Muslims in general, you assume that anything that represents Muslims in a positive light must be a whitewash that glosses over all the terrible things you believe Muslims must have done. I think your review is propaganda masquerading as an impartial analysis, but there you go. Each to their own. In a way I can understand why you are the way you are: most people know little about Muslims and what little they are shown on TV is almost never positive. When people do research Islam, it’s usually with a view to finding evidence to support their own preconceived negative ideas about Muslims. As for Muhammad not being depicted in the film, it’s not ridiculous as you claim. You think it is ridiculous because you do not understand Islamic culture and think you know everything when you do not. So you cast immature judgement instead of educating yourself and trying to understand a cultural perspective different to your own. The reason why depictions of Muhammad are considered blasphemous is because the Prophet Muhammad’s central message was that people should only worship the one true God. There should be no idols, like the 360-odd statues that used to reside in the Kabaa in Mecca. Was this not one of the main features of film? I think so. The Prophet Muhammad’s fear was that after his death, people may start worshipping his image instead of worshipping God. Just like how 600 years after Jesus, the Arabs in Mecca started worshipping statues and filling the Kabaa (the house that Abraham built) with false idols. That is why Muslims never allow pictures or painting of The Prophet. It is out of respect for him as a man. It is also to respect God by not attempting to assign a divine nature to worldly objects like clay or wood. In some Christian faiths they create religious pictures which are worshipped as icons. Muslims are dead set against avoiding this, which is why Muhammad is never painted or drawn and why he’s not explicitly shown in the film Now you can agree or disagree with this information according to your heart’s desire, but your failure to research and understand this point is sloppy. Especially when the film makes special mention of this specific point at the very beginning. (1) My view that the film constitutes, in part, religious propaganda, is based on my perspective as a film critic. Incidentally, I’d make the same criticism of Ben-Hur and The Passion of the Christ. I’m fine with films telling their stories from particular perspectives, but when the perspective is religious and the film seems (to me) to take a simplistic approach in service of its religious aims, I maintain that it deserves to be criticised as propaganda. (2) I don’t have “a negative opinion of Muslims in general”, as you claim. (3) I didn’t label the adherence to Islamic beliefs regarding depictions of Mohammad ridiculous because I think the beliefs themselves are ridiculous, or because I don’t know about or understand them. I simply said that the adherence to those beliefs hamstrings the film and the particular workarounds used are ridiculous. I respect the beliefs in question, but if adherence to them is going to result in such ridiculous scenes, well, maybe this isn’t the right subject matter for the filmmakers to be tackling. (1) I don’t agree with you that the film takes a simplistic approach. The film tells the story of the Prophet Muhammad from the Islamic perspective. I presume you’re arguing “simplistic” and “propaganda” because the film doesn’t devote any time to non-Islamic views which may differ from the traditional Islamic perspective… and thereby provide you with a more complex narrative of the Prophet Muhammad’s life with lots of contradictions and controversies to entertain you and leave you with something to ponder. If you’re seeking an alternative, non-Islamic, version of the Prophet Muhammad’s life then you need a film directed by someone with those views. An Islamic film doesn’t need to devote screen time to its critics in order to avoid allegations of simplicity and propaganda. This is a film told from an Islamic perspective, not a university thesis on comparative religion which is devoted to discussing multiple worldviews or a tabloid version of the Prophet’s life to spice up interest for the audience. Be sceptical of religion or Islam if you want, but I don’t agree that your scepticism is grounds for asserting “simplicity” or “propaganda” in the film. It’s simply a worldview different to your own. (2) So you say. Let’s move on. (3) I disagree with you that the film was hamstrung by the visual absence of the main protagonist. I think the film reflected the spirit of its subject matter with Muhammad’s visual absence and I’d argue the visual absence formed part of the religious message underpinning the film. I understand you don’t like the fact that the main protagonist is not directly shown on screen and you think this is ridiculous, but that’s your opinion and not some universal filmmaking faux pas that calls into question the filmmaker’s choice of subject matter. This is not the first film made where a central character is not visible on screen and I can think of at least one famous example where this attribute was well received by critics and audiences alike.